Our sister publication Irish America magazine is delighted to announce that Vice President Joe Biden will be the main speaker and an honoree at the annual Irish America Hall of Fame event in March in New York. The Irish America Hall of Fame was founded in 2010 by Irish America magazine to honor the extraordinary achievements of Irish American leaders. 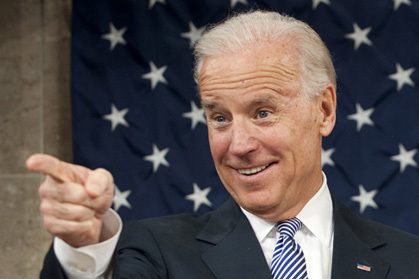 Biden is of Irish descent on his maternal side of the family. His great-grandfather, James Finnegan, emigrated to America from Carlingford, Co. Louth in 1850. He traveled with his mother Jane Boyle Finnegan from Carlingford and they boarded the ship the “Marchioness of Bute” in Newry, Co. Down according to top genealogist Megan Smolenyak. His great grandfather incredibly was a near blind musician who made the crossing with the family when he was very young, just 10-years-old. As Smolenyak writes, “I knew from my research to this point that I was looking for a James Finnegan who was born around 1840 with parents named Owen Finnegan and Jane (Boyle) Finnegan, who would have probably married in the late 1830s, since James was the oldest of their known children. Biden’s story is the story of America. From humble beginnings and ancestry in Co. Louth to the vice presidency of the United States, it is an amazing story. In addition to Biden the 2013 inductees include art collector, entrepreneur and benefactor Brian Burns, businessman and philanthropist Robert M. Devlin, hotelier and humanitarian John Fitzpatrick who is the new chairman of the American Ireland Fund, and former Congressman Bruce Morrison, an esteemed lawyer and immigration reformer. “Our Hall of Fame honors those who have excelled in their chosen fields while acknowledging that we stand on the shoulders of our ancestors – those brave Irish who took the first steps into the unknown so that their children might have a brighter future in America,” said co-founder and editor-in-chief Patricia Harty. In addition, a special presentation will be made to former U.S. ambassador to Ireland Jean Kennedy Smith, honoring her diplomatic work on peace in Northern Ireland and her furthering of the Kennedy family’s distinguished legacy of public service. This year marks an important milestone in Kennedy history, as the 50th anniversary of both President John F. Kennedy’s seminal visit to Ireland, on which Kennedy Smith accompanied him, and of his tragic death. The Irish America Hall of Fame celebrates its honorees’ diverse and significant contributions to American and Irish society, and their personal commitment to safeguarding their Irish heritage. The hall is housed at the Dunbrody Famine Ship and National Emigration Centre in New Ross, Co. Wexford, the ancestral town of President Kennedy. Previous inductees include President Bill Clinton (2011), actresses Maureen O’Hara (2011) and Fionnula Flanagan (2012), dancer and choreographer Michael Flatley (2011), former Coca-Cola head Don Keough (2010) and executive chairman of Ford Motor Co. Bill Ford, Jr. (2011).